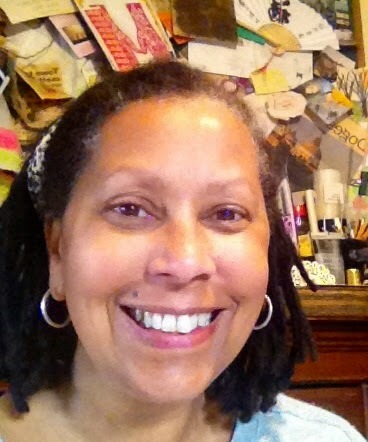 Hello and welcome ! 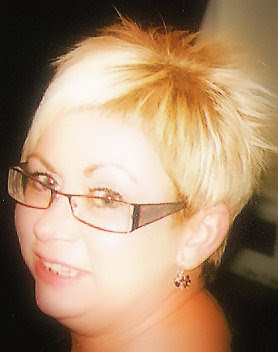 Today we are joined by the very talented Lula of u Luli blog. Lula was chosen by the DT as the winner of the Small is Beautiful challenge and was asked if she'd like to join us for a day. So, without further ado let's move on and hear from Lula ! I come from the north of Poland. 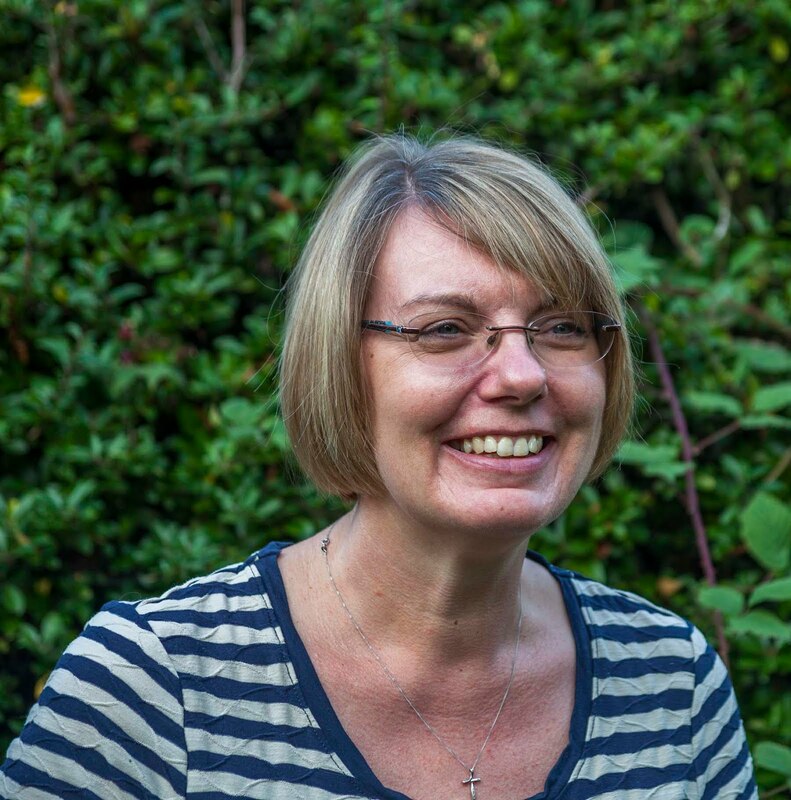 Fifty-six, part time working widow, mum of two grown up boys and a proud grandma. 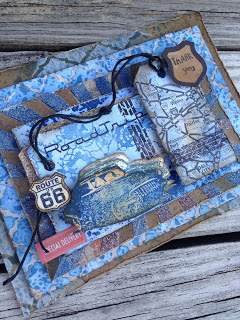 I started my crafting journey 3 years ago as a card maker and immediately became an addicted paper-lover. My latest craze is playing with mixed medias and altering things. My beloved husband has passed away recently and I found true solace in crafting. I love challenges to spark my creativity and I love making crafty friends all over the world. This is my take on the theme: Time Flies. 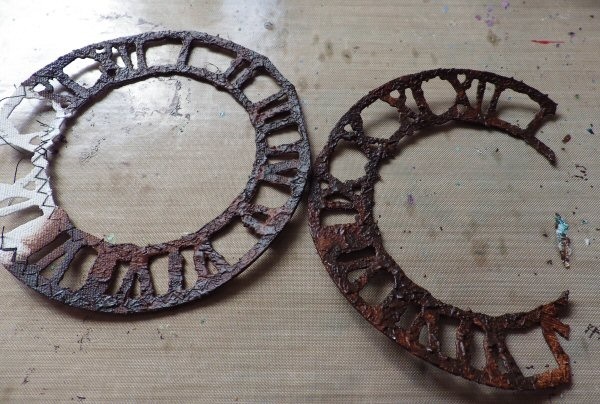 I altered a clock from the charity shop. I started with covering the whole piece with black gesso. 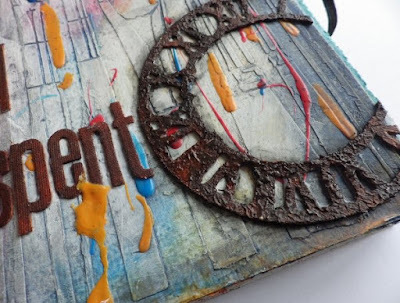 To add the texture I put some modelling paste on it, using the Tim Holtz Burlap stencil. Next I decided to add some die cuts to make the surface more dimensional. 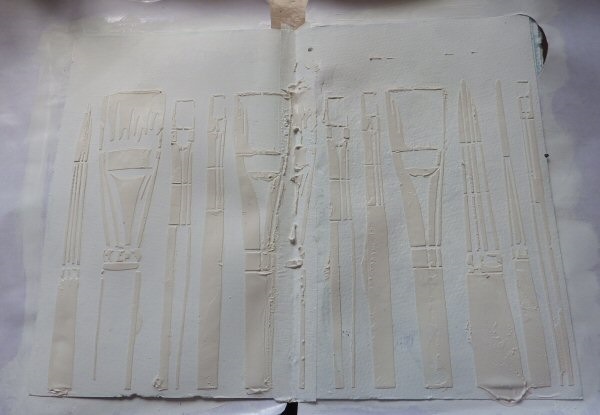 Another layer of black gesso was put on it as well as on some metal and chipboard embellishments. I stick all pieces together with gel medium and started adding colours with Inka Gold metallic paints - very shimmery paints with great shine. Then it was time for the dial. 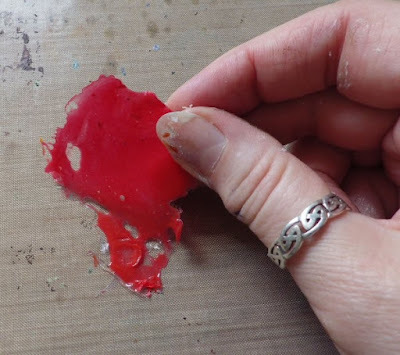 I stamped and embossed it with Shimmerz Enamel- Molten Metal. Some die cut cogs, metal pieces , hand made button with the photo and some lettering was added to it. Hope you like it! Absolutely beautiful project Lula ! I'm sure you'll all agree that Lula's piece has provided even more inspiration for the current challenge Time Flies which you still have time to join in with ! Glazing, drippage and rust ! Hello and welcome to today’s Inspirational Post ! It’s Sue here and today I’m sharing a journal page that was inspired by the wonderful Donna Downey. 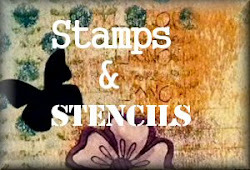 I’ve had some of Donna’s stencils in my sticky mits for a while and not had chance to have a play so today is the day ! 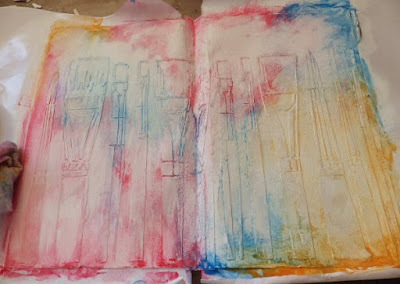 For this journal page I’ve used the wonderful Donna Downey paintbrush stencil and started with Grunge Paste over a Gessoed page. Once the paste was dry I used with London Bus Fresco Finish paint mixed with acrylic satin glazing fluid and using my finger rubbed it over the page. I then used Tango and Blue Glass Fresco Finish paints and did the same thing, leaving the colours on the page for a minute or so before taking a baby wipe and wiping it back. It leaves just a hint of the colours behind, but I love this, and it’s starting to look like the kind of artist palette I had in mind. 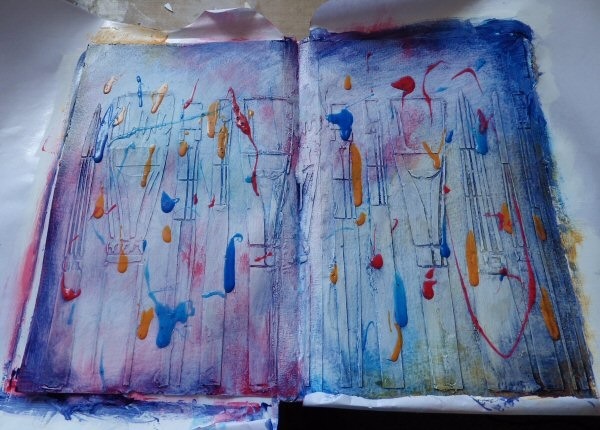 Now as it was an artist palette that my thoughts were following I wanted to have lots of drips and having recently dabbled with Clear Tar Gel, which you can see here, so I reached for it again. 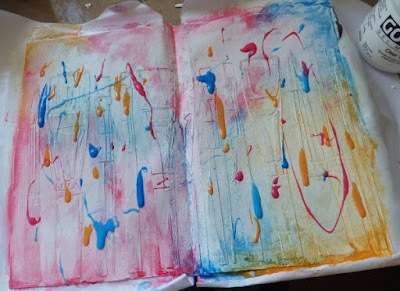 I mixed the gel separately with Tango, London Bus and Blue Glass and then dripped it over the page, standing the book upright to encourage it to run down the page. 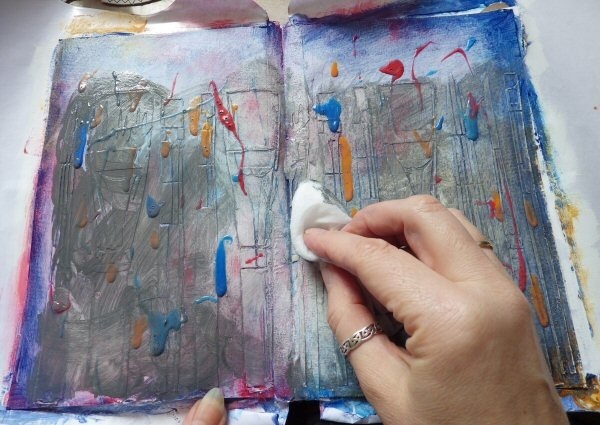 The gel takes a little time to dry so I left the book over night as I didn’t want to use a heat gun on it. I wanted to add more depth so next up was Golden’s Payne’s Grey, not at all grey but this wonderful rich, deep blue! It was mixed with the glazing fluid and painted over the whole page. 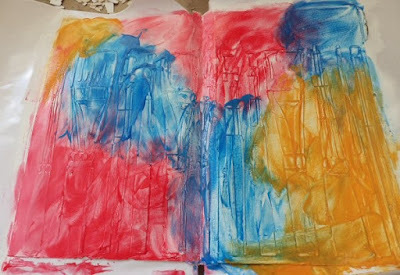 After a minute or so I then wiped it back with a baby wipe, the hints of the darker blue are caught in the texture of the Grunge Paste and the layers of colour are now blending and creating depth. I still felt that there was more needed so I first of all sanded the Grunge Paste making the brushes look a little more shabby then reached for Slate Fresco Finish paint and again mixed it with the glazing fluid but only painted it around the paint brushes this time. It was left for a minute then wiped back, now I was a lot happier ! 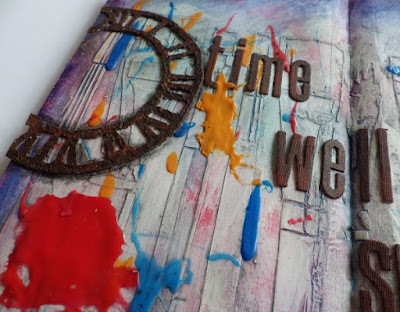 I’d decided to tie this page into the current challenge here at Stamps and Stencils which is Time Flies and one of the things that Donna encourages is to use what you already have. So, looking at the bits and pieces strewn all over my work space I spotted some die cuts that I had intended to use on another project but changed my mind. 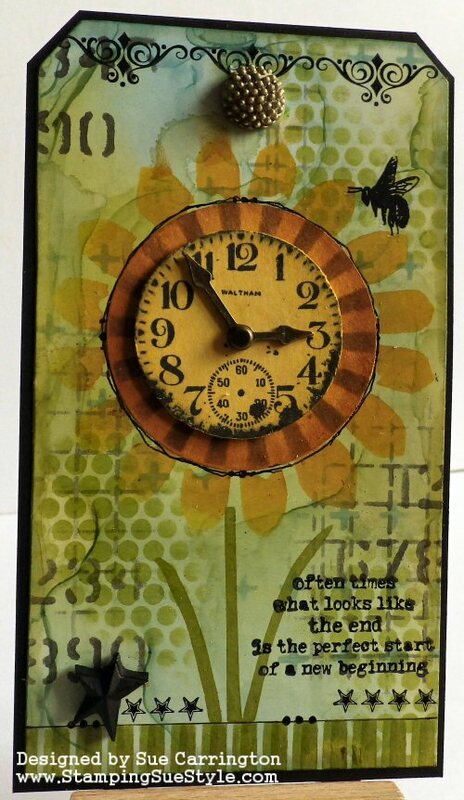 The clocks are die cut from Claudine Hellmuth’s sticky back canvas which is stuck to the Heavy Smoothy card. I’d also zipped around the edges with my sewing machine, so there was lots of texture already, but I wanted more ! I used Grunge Paste again and patted it on to the clocks using a metal spatula to create a stippled effect. 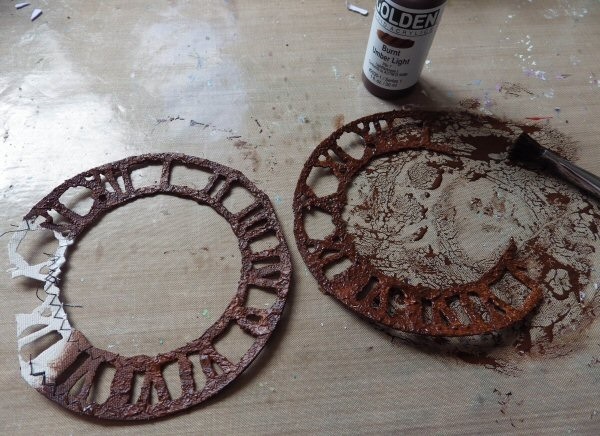 I wanted the clocks to have a rusted, forgotten look to them so first of all painted them with Golden Quinacridone Nickel Azo Gold. Next up was Burnt Umber Light which was starting to give me the finish I was after. To add some depth I used Raw Umber and now I was quite happy ! 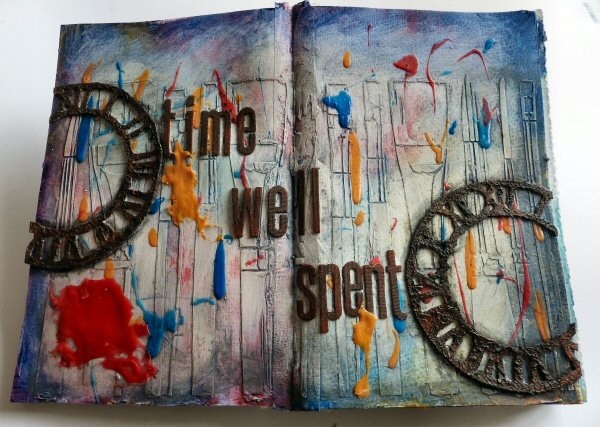 I didn’t want to add too much more at this point as I wanted the brushes and drips to still be visible, but I needed some words and reflecting on what I wanted to achieve on this page I came to the conclusion that my time had been well spent, so that was what I used ! 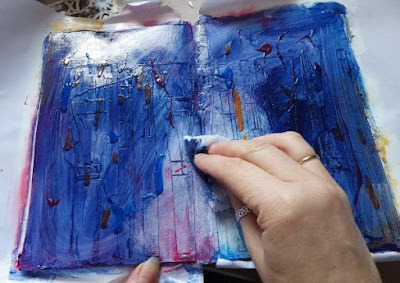 In true Donna style I looked around at what I could use up and saw some off cuts of the card covered with sticky back canvas (I’d forgotten how useful this stuff is!). 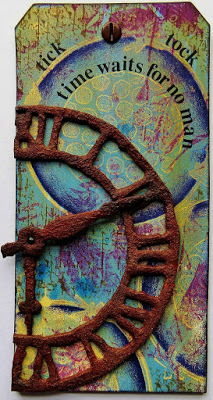 I die cut the letters using the Tim Holtz Block Talk Lower Case die and then used the Golden colours I'd used on the clock to paint them. There was one last thing that happened by accident. I hadn’t wiped up the mess I’d made with the Clear Tar Gel and it had dried overnight and the result is coloured skins ! 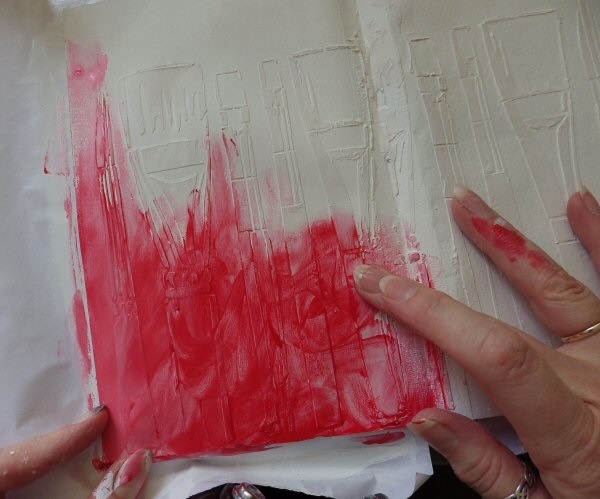 These were in all sorts of shapes but perfect for adding that ‘splodge’ of paint effect. The current challenge of ‘Time Flies’ still has a couple of weeks to go so you have plenty of time to join us, and I hope you find that your time is well spent too ! Hello and welcome back ! Today we're sharing the winner and the top 3 of the Happy Holidays challenge. There were so many beautiful entries and so many different interpretations they were all wonderful, but as usual there can only be one winner. Congratulations Claire! 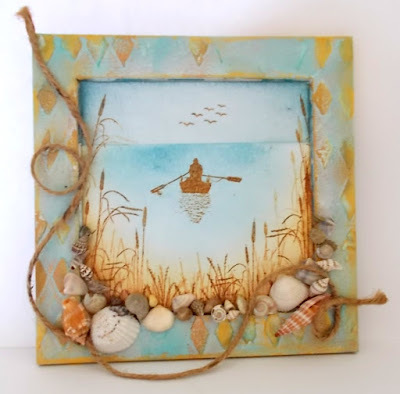 Your project is absolutely beautiful and the serene scene is just fabulous ! 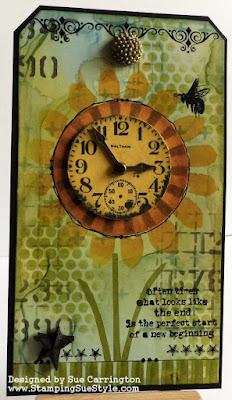 As the chosen winner Claire will be invited to Guest Design for Stamps and Stencils at a future date. 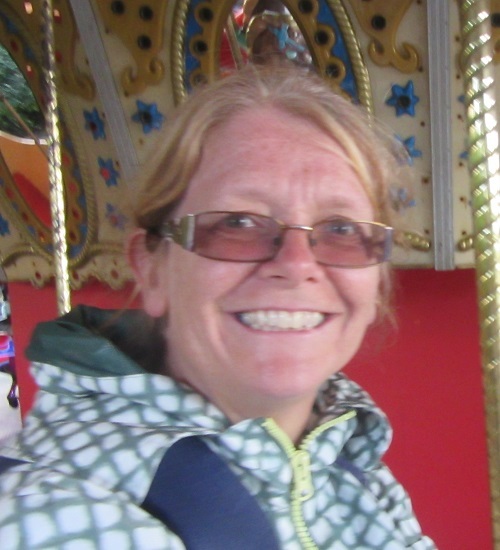 Claire please email carringtons22@yahoo.co.uk for the details. The current challenge is Time Flies and you've still got plenty of time to join in. as a focus of your project. So really easy for you to join in ! 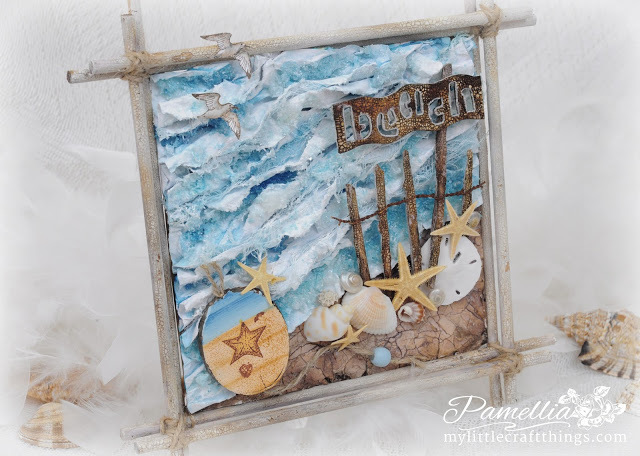 Remember we are a mixed media blog and you will need to include some stamping or stencilling. The design team have made some fantastic pieces that we hope will give you lots of inspiration! 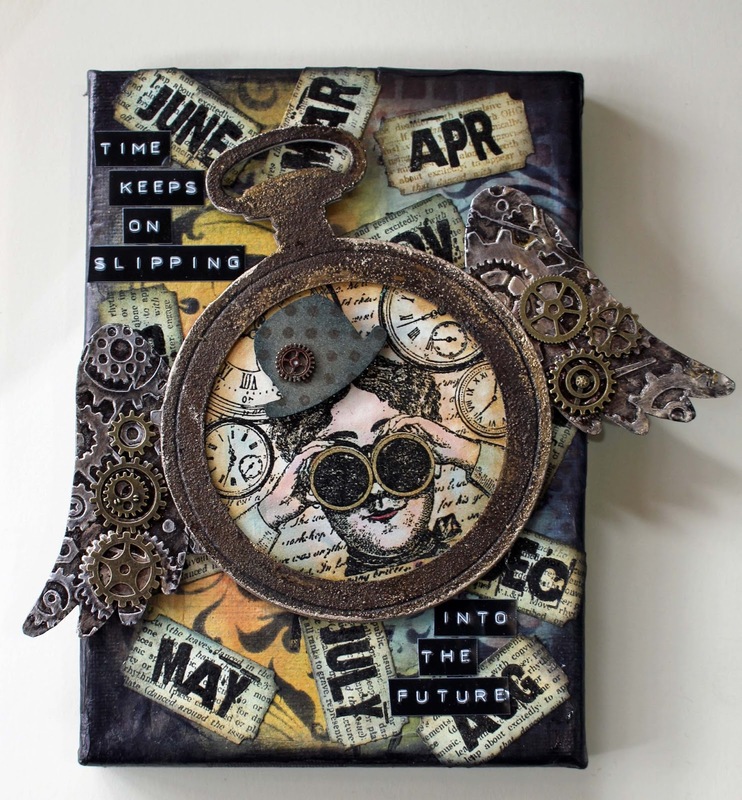 to see your 'Time Flies' projects!